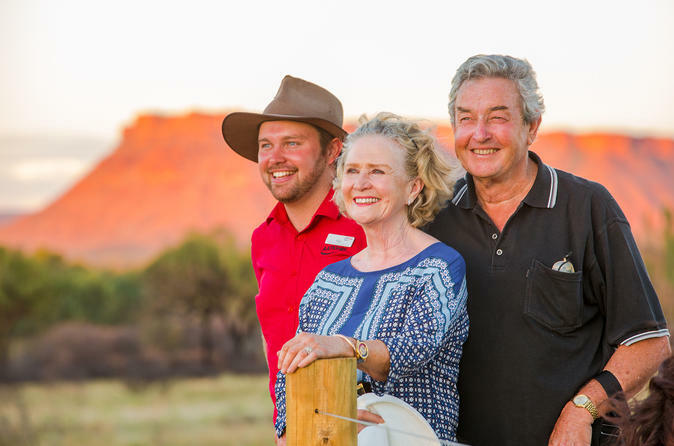 This three-day independent coach tour includes meet and greet at Ayers Rock Airport with a transfer to your hotel, the highlights of Uluru (Ayers Rock), including two nights at Ayers Rock Resort in your choice of accommodation. Experience the majesty of this monolith, the neighboring Kata Tjuta (Olgas) and the magnificent Kings Canyon rim walk. On arrival at the airport you will be transferred to your hotel on board a coach. This afternoon travel around the base of Uluru with a local driver/guide. Learn about the native flora, fauna and intriguing cultural traditions of traditional owners, the Anangu, and discover an array of fascinating sacred sites. Join your guide for a walk to Mutitjulu Waterhole. You'll explore a number of caves and view Aboriginal rock paintings as your guide interprets their meaning and significance. Later visit Uluṟu - Kata Tjuṯa Cultural Centre. Travel to the Uluru sunset viewing area and relax with a glass of wine and nibbles as the sun sets over the western horizon and the evening sky brings out the many shades of color for which Uluṟu is known. After sunset, a guide will transfer you to the exclusive barbecue site. The site is within the Uluru National Park, outside the Uluru & Kata Tjuta Cultural Centre set among red sand dunes and desert oak trees providing a peaceful desert setting. Once at the site, you will be served a variety of Australian meats and salads, accompanied by a glass of sparkling wine, beer or orange juice (menus are subject to change). After dinner, you will be served tea, coffee, and dessert and your guide will conduct a tour of the night sky, describing and pointing out some of the visible constellations with the assistance of a high beam spotlight (weather permitting). Travel from Ayers Rock Resort to Kings Canyon, stopping for breakfast at Kings Creek Station. Originally vacant crown land, the station now runs cattle and is the largest exporter of wild camels in Australia. Make the steep rocky climb to the rim of the Kings Canyon for spectacular views of Watarrka National Park. Follow the rim of the canyon stopping to look down into the canyon gorge from a series of look-out points along the way. The rim walk takes approximately 3 hours to complete and is recommended for those with a good level of fitness. Alternatively, explore the boulder strewn canyon floor. After lunch (own expense), return to Ayers Rock Resort. Rise early this morning to travel to the Uluru sunrise viewing area. Watch the first rays of the sun set the Red Centre alight while enjoying a warming cup of tea, coffee or hot chocolate, then travel to Kata Tjuta. Arrive at Walpa Gorge to take a walk that follows the natural creekbed between two of the main domes.